A side dish made of potato and raw pigeon peas garnished with spiced up grated coconut. A good side dish for rice or roti. Raw pigeon peas are available in the market during winter. This is nothing but toor/Arhal dal at its raw stage. It is a good source of protein for vegetarians. Peel the pigeon peas. Add water just enough to barely cover the pigeon peas. Add turmeric powder. Close with a lid and cook, checking and stirring occasionally. Cook until pigeon peas are tender but firm. Add salt and mix well. Meanwhile, wash, peel, and dice the potatoes into cubes. In a pan, add a teaspoon oil, add the diced potatoes, cover and cook. Stir occasionally. Add salt. You can cook both the potatoes and the pigeon peas in parallel. Cook until potatoes are tender and edges are roasted. Add salt and mix well. Remove the potatoes from the pan. Add half a teaspoon oil to the pan. Add urad dal and dry red chilies. Roast until urad dal turns red. Remove from the pan. In a mixer jar, dry grind the roasted urad dal and dry red chilies first. When this is coarsely powdered, add grated coconut, peeled garlic and shallots. Grind coarsely. 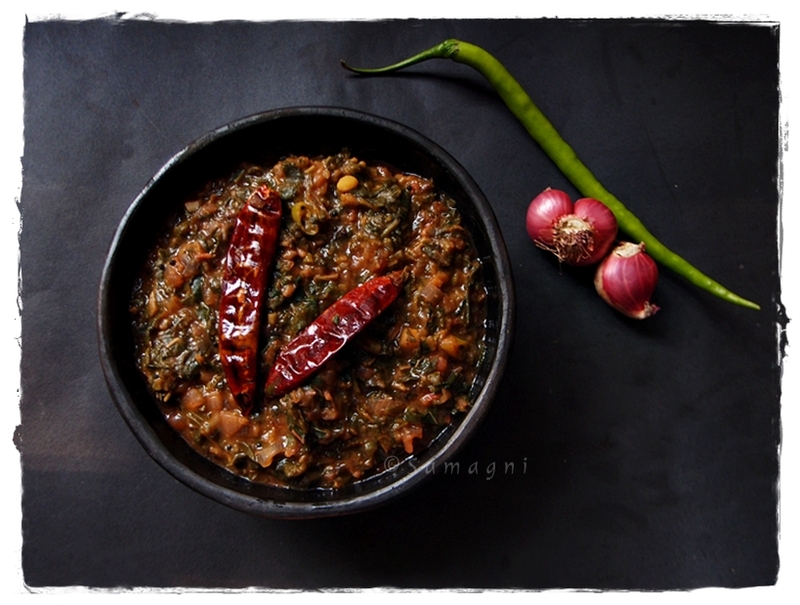 This mixture has a wonderful aroma of roasted urad dal, chilies, shallots, and garlic. Keep aside. In the pan add half a teaspoon oil and add mustard seeds. When the mustard seeds splutter, add asafetida powder and curry leaves. Add cooked pigeon peas, cooked potato cubes, and the coarsely grounded masala. Mix well. Taste and adjust salt. Let this cook in low fire for at least 5 mins. Serve hot along with rice or roti. 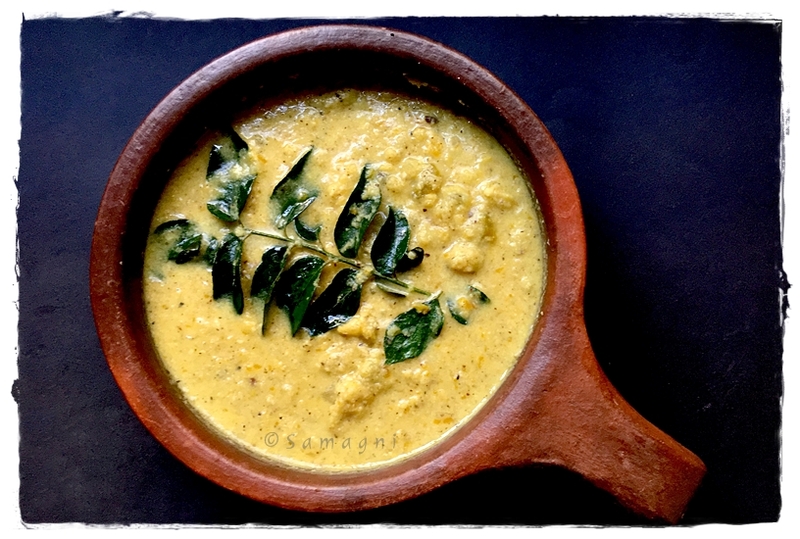 A spicy, tangy, and mildly sweet curry that goes well with rice, idli, dosa, or even roti. Add half a cup of warm water to the tamarind and let it soak. This is to help extract maximum juice from the dry tamarind. Keep this aside for 10 mins. Use a mixer to grind the grated coconut along with a teaspoon of mustard seeds to a fine paste. Keep aside. Cut (halve) the green chilies. Heat half a teaspoon oil in an pan. Add the split green chilies and saute until the raw smell goes away and the green side of the chilies get roasted. Remove the pan from fire and keep a vessel containing a cup of water on fire. Add the chilies roasted in oil into the water in this vessel. Add turmeric powder and bring to boil. When the green chilies get cooked, they turn into pale green color. Meanwhile, use your fingers to squeeze the juice out of the soaked tamarind. Strain and add to the cooked green chilies. When the green chilies along with the tamarind water starts boiling, add the ground coconut and mustard seeds paste into it and stir. Add the jaggery powder also. Stir and bring to boil. Heat oil in a pan and add half a teaspoon mustard seeds to it. When the mustard seeds crackle, turn off the fire, add curry leaves, and add this seasoning to the cooked curry. Serve hot with rice. Navarathri is incomplete without this sweet prasad. It is a very important item for the Devi. I make this often to satisfy my sweet cravings. This easy-to-make sweet is a healthy alternative to store-bought sweets that contain preservatives and other harmful chemicals. Wash the cow peas thoroughly and soak it overnight in enough water. Drain the water. Add fresh water just enough to immerse the cow peas and pressure cook the peas (2 whistles should be enough). The peas should be cooked very soft. Otherwise they tend to become hard when cooked in the jaggery syrup. 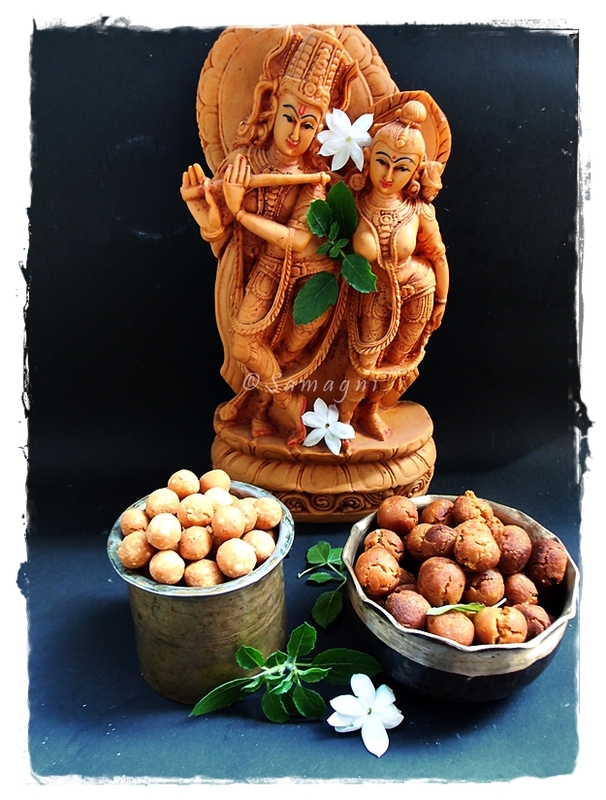 Melt jaggery in half cup of water. Strain to remove impurities. Pour the strained jaggery solution into a thick bottomed pan and heat to make a soft and thick syrup. When the syrup starts to thicken and bubble vigorously, add the cooked peas and cardamom powder. Stir occasionally and cook until all water content is absorbed and the jaggery coats all the cow peas thoroughly. Turn off the fire and garnish with grated coconut.